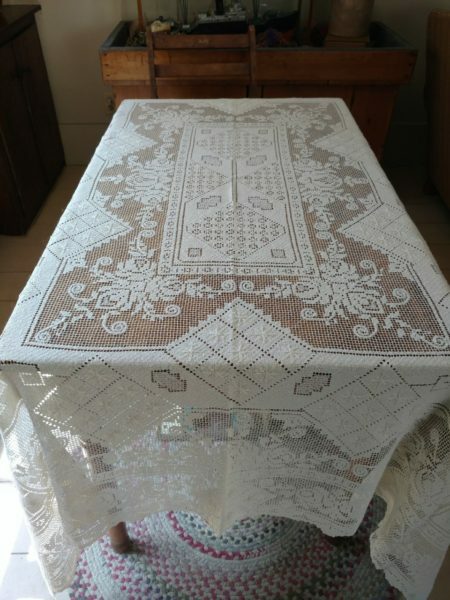 A vintage Art Deco 1920’s darn net knotted lace lacis tablecloth. This type of tablecloth was all the rage during the 1920’s and 1930’s ~ everyone had one, or wanted one for their dining room table. Suitable for holiday, bridal, wedding , formal or just about any type of entertaining. This would not be a disappointment. This lovely Art Deco cloth is worked in a filled stitch of roses, and scrolls. Other filling stitches of diamonds, squares and geometric shapes. The center of the cloth is rectangular in shape. Tablecloth edge is a scallop and point design. An attractive cloth worked in both open and knotted filet. Cotton thread. White in color.